It's hard to time things just right on your wedding day. But there are some tips that could help out when to do what. 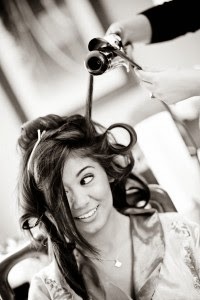 If your hairstylist is coming to you give yourself an hour in your schedule for your hair. If you are going to a salon double that. Its better to have too much time than not enough. Depending on the type of make up, it should take about 45-60 minutes. Also always have the bridesmaids done first. That way when the bride is getting done up, when the photographer arrives, they can take some of those precious getting ready photos of the brides fresh make up and hair. On a side note, have the photographer arrive about an hour before the bride is done. Put on the veil after the dress, and make sure its secure. If you are having pre-ceremony pictures taken, plan 2-3 minutes a shot. More if you have a large group and less if you have a small group. If you are doing a first look, 15-30 minutes.